A regular breeding resident and migrant in Minnesota. Black-throated Blue Warblers were uncommon during the Minnesota Breeding Bird Atlas (MNBBA). Found in northeastern and sparsely in upper midwestern North America from Nova Scotia to western Ontario and Minnesota and south in the Appalachian Mountains to northern Georgia (Figure 1). Patches of highest densities are found scattered in Ontario, Nova Scotia, and New York State, as well as in western North Carolina and eastern Tennessee. Continental Concern Score of 7/20 by Partners in Flight; identified as a Species in Greatest Conservation Need in Minnesota by the Minnesota Department of Natural Resources. Long-distance migrant, this species primarily overwinters in the Caribbean and in Central America. Insects, spiders, and other arthropods that are gleaned primarily from deciduous shrubs and trees. Cup nest usually low or close to the ground in deciduous or coniferous shrubs or saplings. Breeding distribution and relative abundance of the Black-throated Blue Warbler in North America based on the federal Breeding Bird Survey from 2011 to 2015 (Sauer et al. 2017). Described as one of the rarest breeding warblers in the state by Roberts (1932), the Black-throated Blue Warbler was primarily found as far south as Pine County and west to Itasca State Park. He suggested Minnesota was the northwestern limit of its breeding range in North America, with few observations from Manitoba. Nesting was reported from Cass Lake (nest with eggs) and Cook (adults with young and two pairs with young) County. In Roberts 1936 revision, he added three additional breeding observations including a nest with four eggs at Loon Lake in Cook County, a nest with four half-grown young at Lake Winnibigoshish in north-central Minnesota, and a “pair feeding 2 half-grown young” at Lake Vermilion in St. Louis County. More than 40 years later, Green and Janssen (1975) emphasized its breeding distribution as northeastern and north-central Minnesota but “scarce throughout most of this range except in Cook County.” They included confirmed nesting in Beltrami, Cass, and Cook Counties and inferred nesting in Clearwater and northern St. Louis Counties. Several years later, Janssen (1987) suggested a greatly restricted breeding range limited to Cook County and eastern Lake County. He stated the Black-throated Blue Warbler was “casual in the north-central region of Beltrami, Cass, and Clearwater Counties.” Both Janssen (1987) and Hertzel and Janssen (1998) only cite confirmed nesting in Cook and Lake Counties since 1970. The Minnesota Biological Survey (MBS) recorded 288 breeding season locations for the Black-throated Blue Warbler (Minnesota Department of Natural Resources 2016). These locations were very extensive along the North Shore of Lake Superior from southeastern St. Louis to Lake and Cook Counties but were also relatively common in the northern portions of these counties. Additional potential breeding locations were from eastern Becker County, Cass County near Leech Lake, northern Mille Lacs County, and western Itasca County. The MNBBA reported 317 records, most of which were concentrated in northern Cook, Lake, and St. Louis Counties, plus western Itasca County (Figure 2). The latter area roughly corresponds to the eastern region of the Chippewa Plains Ecological Subsection. Nesting was confirmed in Cook and Lake Counties. Probable nesting activity was recorded in southern Aitkin, northern Cass, western Itasca, and St. Louis Counties, and possible nesting in Beltrami County. Breeding observations were surprisingly sparse along the North Shore of Lake Superior compared with those from the MBS, except for southeastern Lake County and in Cook County. The species was only observed in 3.0% of the priority blocks (69/2,337) (Figure 3; Table 1). The probability map for the Black-throated Blue Warbler predicted the species to be almost exclusively found in Cook and eastern Lake Counties (Figure 4). Some possible habitat is predicted to exist in other portions of the northeast, the north-central region, and east-central Minnesota. Overall the map is consistent with the suggestion above from Janssen that the Black-throated Blue Warbler is primarily found in Cook and Lake Counties. Overall this species continues to be a relatively rare warbler in Minnesota, except for the extreme northeastern portion of the state and in western Itasca County. Scattered breeding observations may be expected in appropriate habitat throughout much of the Laurentian Mixed Forest Province. Observations in Wisconsin and Michigan (Cutright et al. 2006; Brewer et al. 1991) both suggested that the species’ breeding range had retracted northward with the clearing of forests and conversion to agriculture and urbanization over the past 100–150 years. The breeding bird atlas for Ontario (2001–2005) also indicated breeding populations along the northern shore of Lake Superior, with scattered observations extending to the extreme southwestern regions (Cadman et al. 2007). Manitoba’s breeding bird atlas (2010–2014) only recorded one possible nesting from the extreme southeastern portion of the state. In their review of the Black-throated Blue Warbler in North America, Holmes et al. (2005) stated that the breeding habitat for this species shrank considerably with the clearing of mixed deciduous/coniferous forests in the northeastern United States in the seventeenth and eighteenth century. However, with the subsequent abandonment of farmland in the New England states, the species has increased again in the late nineteenth and twentieth century. The authors felt that the breeding habitat of the Black-throated Blue Warbler was more extensive now in the early twenty-first century than it was 100 to 150 years ago. There is little evidence that these changes have occurred in Minnesota because of the paucity of observations reported by Roberts from more southern locations in the state. However, its distribution may have retracted to some extent, because the MNBBA did not record it from as far west as Clearwater County, nor were there any observations from Pine County, where Roberts had reported it previously. Breeding distribution of the Black-throated Blue Warbler in Minnesota based on the Breeding Bird Atlas (2009 – 2013). Summary statistics of observations by breeding status category for the Black-throated Blue Warbler in Minnesota based on all blocks (each 5 km x 5 km) surveyed during the Breeding Bird Atlas (2009-2013). Summary statistics for the Black-throated Blue Warbler observations by breeding status category for all blocks and priority blocks (each 5 km x 5 km) surveyed during the Minnesota Breeding Bird Atlas (2009-2013). Predicted breeding distribution (pairs per 40 hectares) of the Black-throated Blue Warbler in Minnesota based on habitat, landscape context, and climate data gathered during the Minnesota Breeding Bird Atlas (2009-2013) using the General Linear Modeling method with an adjustment for detectability. The breeding habitat of the Black-throated Blue Warbler has been well studied in the eastern United States by Holmes et al. (1996, 2005). They have generally described the breeding habitat as undisturbed upland deciduous or mixed deciduous-coniferous forests. Habitats are usually dominated by maples, birches, and other northern hardwoods, with varying amounts of spruce, fir, or hemlock east of Minnesota (Robbins 1991; Niemi and Hanowski 1992; Holmes et al. 2005). These forest types are usually characterized by thick understories of saplings and shrubs, often with scattered gaps (Figure 5). The National Forest Bird (NFB) Monitoring Program indicated the species prefers mature aspen-spruce-fir and mature upland hardwoods, but it was only sufficiently counted in the Superior National Forest of Minnesota and the Nicollet National Forest in northeastern Wisconsin (Niemi et al. 2016). Upland hardwoods were more than 60 years of age and primarily comprised of maples and basswood. The species avoided young or regenerating forests as well as most lowland forest cover types. During the MNBBA point counts, Black-throated Blue Warblers were primarily found in upland coniferous forest and northern mixed forest landscapes (Figure 6). Robbins et al. (1989) listed this species as area-sensitive because the Black-throated Blue Warbler was primarily found on forest tracts larger than 100 ha. Finch (1991), using data from Robbins et al. (1989), suggested the minimum area for breeding was 1000 ha. Holmes et al. (2005), in their review and from Holmes’s own data in New Hampshire, questioned whether the evidence was sufficient to identify this species as area-sensitive. Data for Minnesota and the upper Midwest are limited, but Grinde (2015), in an analysis of colonization and extinction rates, found that the Black-throated Blue Warbler experienced increased local extinction probabilities in small forest patches. Typical breeding habitat of the Black-throated Blue Warbler in Minnesota (© Gerald J. Niemi). Habitat profile for the Black-throated Blue Warbler based on habitats within 200 m of point counts where the species was present during the Minnesota Breeding Bird Atlas (2009-2013). The overall North American breeding population was estimated as 2.4 million breeding adults by Partners in Flight (PIF)(Rosenberg et al. 2016). Previously PIF (Partners in Flight Science Committee 2013) had estimated a Minnesota breeding population of 4,000. However, the MNBBA estimated a Minnesota breeding population of 78,000 adults, which is a substantially higher population than estimated by PIF. This discrepancy was likely largely due to the lack of coverage by the federal Breeding Bird Survey (BBS) routes in northern Cook, Lake, and St. Louis Counties upon which the PIF estimates were based (Sauer et al. 2017). These roadless areas, such as the Boundary Waters Canoe Area Wilderness, were covered by the MNBBA. Population trend estimates from BBS counts in Minnesota are unreliable because the species was only sufficiently recorded on 11 routes. Estimates from the Boreal Hardwood Transition Region for 183 routes indicated a significantly increasing population of 1.34% per year from 1966 to 2015 (Figure 6). Black-throated Blue Warblers were also not abundant enough in Michigan, Ontario, or Wisconsin to estimate population trends. Recent estimates from Partners in Flight (Rosenberg et al. 2016) from 1970 to 2014 revealed an overall increase in the species’ population of 163%. This is likely due to the reforestation and maturation of many suitable upland deciduous and mixed deciduous-coniferous forests within the New England states and southern Appalachian Mountains. NFB trend estimates showed an insignificant trend with high variability in the Superior National Forest based on consistent annual counts in 17 forest stands (Figure 7). The trend pattern suggested an increase from 1995 to 2003 and a subsequent decline through 2016. Overall, mean population densities in the Chippewa and Superior National Forests were 0.03 and 0.50 pairs per 40 ha, respectively. Densities were very low in mature aspen-spruce-fir in the Superior National Forest and in upland hardwood forests. Population densities in Minnesota contrast sharply with estimates from the northern hardwood forests of New Hampshire, where they vary from a low of 23 pairs to 89 pairs per 10 ha (Holmes et al. 2005). Similarly, BBS routes in Minnesota averaged less than 1 detection per route per year, while in New Hampshire the average was 2.3 detections per route per year (Sauer et al. 2017). 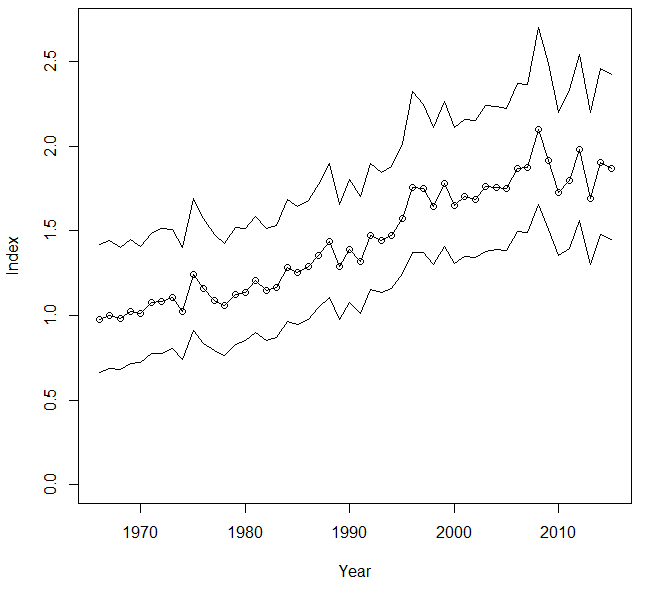 Breeding population trend for the Black-throated Blue Warbler in the Boreal Hardwood Transition Region for 1966–2015 based on the federal Breeding Bird Survey (Sauer et al. 2017). 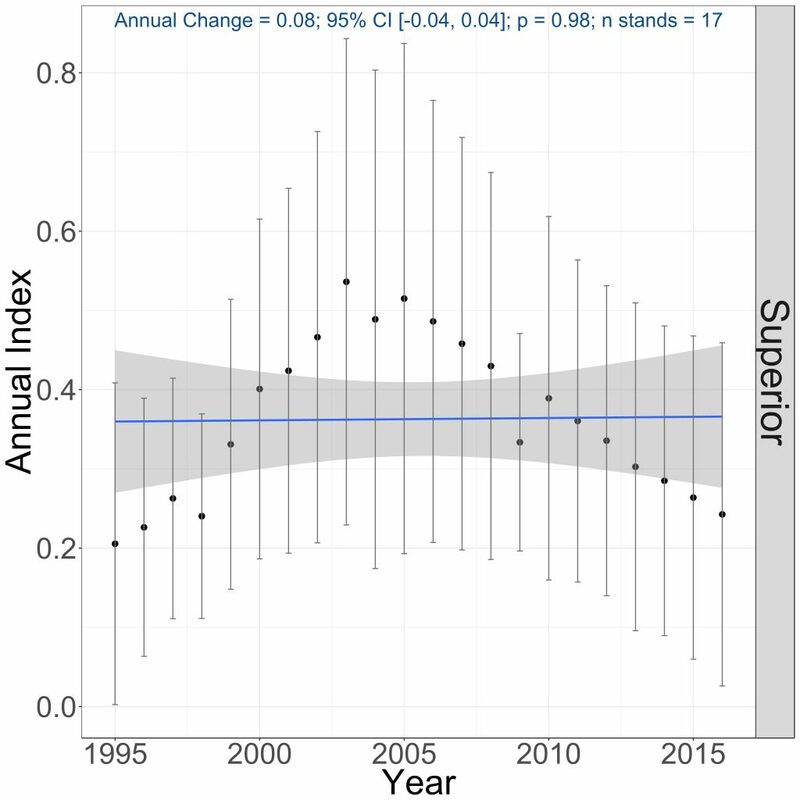 Breeding population trends of the Black-throated Blue Warbler in the Superior National Forest in Minnesota, 1995–2016 (Bednar et al. 2016). The Black-throated Blue Warbler was listed as a Species in Greatest Conservation Need because it is rare and vulnerable, with declining habitat as well as susceptibility to fragmentation (Minnesota Department of Natural Resources 2015). Rosenberg et al. (2016) estimated a low Continental Concern Score of 7/20 primarily because of its increasing population. Even though Robbins et al. (1989) had identified the species as area-sensitive, more recent research has been equivocal. Regarding area sensitivity, Holmes et al. (2005) concluded that the species may be more constrained by habitat characteristics because it tends to avoid younger forests and is primarily found in northern hardwoods with dense understories. Sillett and Holmes (2002) stated that “it is not yet clear how fragmentation impacts abundance, spatial distribution, or population dynamics” and emphasized that the evidence was scarce on whether winter grounds affect populations. Terborgh (1989) had previously listed the Black-throated Blue Warbler as geographically restricted in its winter range but added that it readily accepted the use of disturbed habitats on its wintering grounds. In its review of climate sensitivity by North American birds, Langham et al. (2015) and the National Audubon Society (2015) depicted the species as “climate threatened.” The society suggested a major shift in the species’ stable summer range and a 78% decrease in area of its summer climate space. Rodenhouse and Holmes (1992) modeled potential breeding productivity with climate change. Within the species’ breeding range, the climate was predicted to have decreased precipitation and increased temperatures. They concluded that breeding productivity would increase by as much as 25% under this scenario. They did caution that these predictions came from nesting data at only one site. Arnold and Zink (2011) labeled the Black-throated Blue Warbler as a “super collider” because of its high incidence of mortality near communication towers, where it was ranked the fifth most frequently recorded bird species. They estimated it was 96 times more at risk of tower kills compared with the average bird. Longcore et al. (2013) also identify this warbler as one of the most susceptible species to mortality at communication towers, with 4.9% of its population killed annually. It appeared to be most susceptible to tower kills in peninsular Florida, where it was ranked third among the species most frequently killed within that region. Based on 23 study sites and over 92,000 fatalities at buildings, Loss et al. (2014) rated the Black-throated Blue Warbler as highly susceptible to building window collisions. It was ranked second among all species examined with respect to window collision mortality with a risk factor 45.5 times greater than the risk of the average bird species. The Black-throated Blue Warbler remains an uncommon species in Minnesota, except for portions of northeastern Minnesota. Even though its overall breeding population appears to be increasing, its status deserves to be watched over the coming years, especially with regard to climate change, mortality at windows and towers (to which it appears to be highly susceptible), and sensitivity to forest habitat fragmentation. Holmes, Richard T., Peter P. Marra, and Thomas W. Sherry. 1996. “Habitat-specific Demography of Breeding Black-throated Blue Warblers (Dendroica caerulescens): Implications for Population Dynamics.” Journal of Animal Ecology 65: 183–195. Rodenhouse, Nicholas L., and Richard T. Holmes. 1992. “Results of Experimental and Natural Food Reductions for Breeding Black-throated Blue Warblers.” Ecology 73: 357–372. Sillett, T. Scott, and Richard T. Holmes. 2002. “Variation in Survivorship of a Migratory Songbird throughout its Annual Cycle.” Journal of Animal Ecology 71: 296–308.